You can resolve to do all kinds of healthy, fiscally responsible things in 2015. And you probably should. But these... aren’t those things. They sure look fun, though. Parliament’s making that easy with the Sir Winston Churchill. It’s a cocktail comprised of Johnnie Walker Blue, smoked Punt e Mes, lime and dry curaçao. 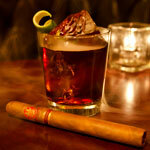 And it’s served alongside a good cigar, which is the finest of all garnishes. 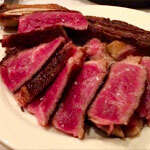 For the most decadent steak in town, head to Knife. There John Tesar is serving up a 240-day dry-aged ribeye that tastes like a meaty white truffle. And it’s priced by the inch, so... bring a ruler. That’s doable at the Ritz-Carlton Spa, because they’ve got an eight-hand massage wherein four masseuses work out your kinks at the same time. Well, it’s either that or a well-trained octopus. Better call to confirm. Greystone Castle is, among other things, a freaking castle. So that’s worth checking out. And while there you can hunt on the game preserve, eat too much, sip scotch in the drawing room and otherwise engage in activities wherein a monocle isn’t out of place. First, you’ll learn a thing or two about operating a supercar. That part’s important. Then you’ll climb behind the wheel of something fast—like a Lamborghini Gallardo or a Ferrari 360 Spider—and proceed to zoom around the 1.3-mile racetrack. Seems foolproof.